Driving around Clermont County, residents and visitors may have noticed these new signs being installed along some major thoroughfares. As you can see, the signs define the borders of Asian Longhorned Beetle (ALB) quarantined areas in the county. 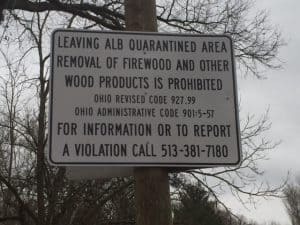 The ALB is a destructive insect that threatens the state’s hardwood forests and the multi-billion dollar forestry and nursery industry that employs hundreds of thousands of Ohioans. 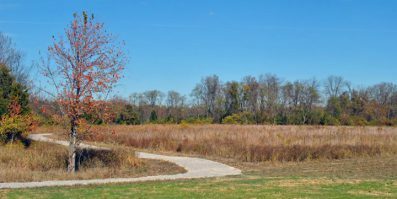 The bug was first detected in Tate Township in 2011. 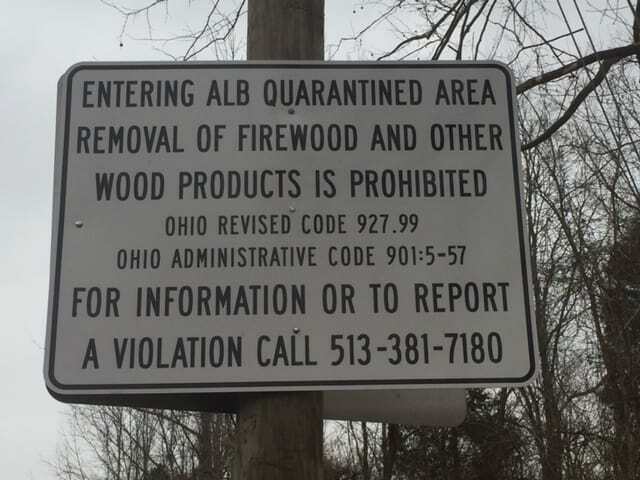 Besides the bug’s natural movement, infestations of ALB can spread through human-assisted movement of firewood and other wood products. It is this type of movement that resulted in the infestations and subsequent quarantined areas in portions of Monroe, Stonelick and Batavia Townships and the type of movement we at the Ohio Department of Agriculture (ODA) are hoping to avoid. 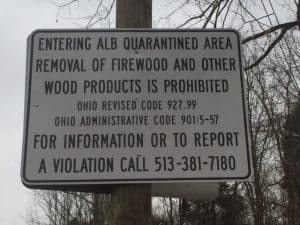 The signs detail the prohibitions on removal of wood from these quarantined areas, enforced by the Ohio ALB Eradication Program, a partnership between the U.S. and Ohio Departments of Agriculture. The program encourages individuals to contact the ODA at 513-381-7180 with any questions regarding the quarantines or to report any wood movement. Please be aware of the regulations in place before moving any wood product, and to keep an eye out for these signs when traveling. You can also visit http://www.agri.ohio.gov/topnews/asianbeetle/ to view quarantine maps and get additional information regarding the ALB. Even if you are not driving through these quarantined areas, it is always good practice not to move wood long distances. The Don’t Move Firewood campaign encourages individuals to “Buy Local and Burn Local” and not risk the movement of different forest pests. You can find out much more information on their website at www.dontmovefirewood.org. For more information, contact 513.381.7180 or email plantpest@agri.ohio.gov.